By Vince Lanci for Soren K.Group. the time to insert links. Feel free to click on the Soren K. group icon for our stories if you wish to find the items referred to. Thanks. 1-We’ve written here in October that a volatility indicator we use was cycling on its lows. This implied the market was due for a range break out on the monthly chart. 2- We’ve also noted more recently that the lows established in mid December were likely a catalyst for a move higher. It was. 3- Part of the analysis in #1 above stated that a $50 move one way would likely never a bigger move; in what direction one would have to assess when the time came. 4-Some 40 Days later after the move #2 projected, we feel Gold is now on the cusp of the bigger move, as in a $50 to $200 drive. 5- Our own personal bias is to the upside based on macro indicators we study. But most recently we did warn that the market is vulnerable to some pummeling below $1330 spot. 6- now, from a different discipline, Michael Moor’s morning note concurs with our volatility assessment. Specifically he included with his daily report a special note. We are not permitted to publish this report as his clients, but think the quote is something worth noting. 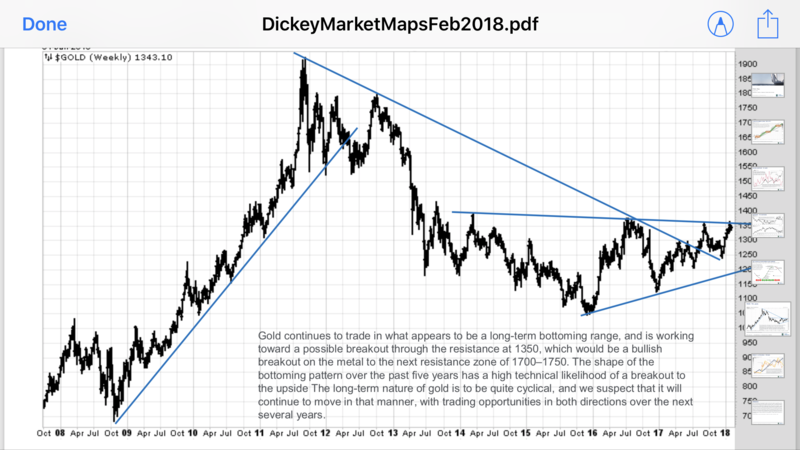 NOTE: this is a time to have a sharp focus on Gold--although it is chopping around here a bit, it is within the $22-$23 zone around the macro solid line, so there is a good likelihood one of the breakouts/failures of the more minor projective moves could be the beginning of a much more major move. And there you have it. As we alluded to in last week’s post, Gold has probably little resistance between $1375 and $1400. It also may have stacked buying in the $1300 area with nothing underneath it. We barely tested the $1300 area a couple days ago and it was greeted with a brick wall of buying. Now we are about to retest those lows. The time is now to pay attention to Gold’s behavior. We have 2 macro technical lines pitted in a war for dominance over gold. The dowmsloping lone we broke to the upside on, amd the line keeping a lid on rallies at the moment. Thanks to George Gero for the chart. And now micro trends are forcing the issue. The market may not pick its macro direction today, but the war has begun. And it is time to pay close attention.